I had only eaten King Cake once before, at a friend's party. After hearing that it was de rigeur for a Mardi Gras celebration, I had it built up in my head as some grand fancy pastry. 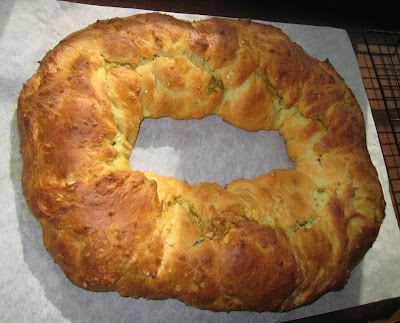 It was a little disappointing to find that it's actually a ginormous Danish, either braided and plain or filled, in the style of the French galette de rois, with an almond paste, or even a cream cheese mixture. Now that I'm a bread-baking fool, I thought I'd try to make my own version by altering a sweet bread recipe from my current favorite cookbook, Artisan Bread in Five Minutes a Day. To the book's basic brioche recipe, which I halved, I added 1/4 cup sugar and 1/2 teaspoon grated nutmeg. It's a very sticky dough, so rather than trying to roll it out, I decided to arrange a series of flattened dough blobs in an oval shape on a parchment-lined baking sheet. I then applied a thin layer of pistachio paste (cuz almond is just so done, plus - pistachio!) down the center of the oval, and covered that with the rest of the dough. A whole hazelnut was inserted at random, to stand in for the traditional plastic baby or bean. After an hour and twenty minutes of rising time, the oval was baked at 350F for 35 minutes, then set on a rack to cool. 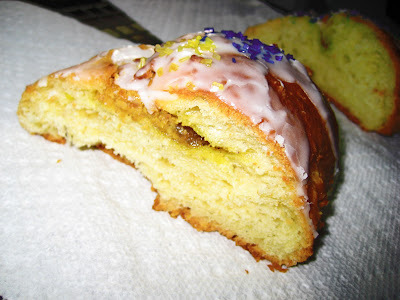 When cool, it was frosted with a mixture of powdered sugar, milk, and lemon juice in the form of True Lemon powder, and topped with the traditional purple, green, and gold Mardi Gras colors in the form of coarse sugar. The verdict? It was good - like a glazed brioche. The pistachio paste was delicious, but it could have used a lot more. (I was afraid to add too much because it might leak out; during the rising, some of it did, but I pinched the dough back in place over the leaks.) A cream cheese filling would have been nice, too. Your cake looks beautiful, and very traditional! My fave is the cream cheese filled- it seems moister than most others! Often, the cakes are made from 3 long tubes of filled dough, which are braided, and then curled into an oval where the ends are joined. This makes a cake that is lighter and airer, with more little "pockets" to discreetly hide the "baby"! 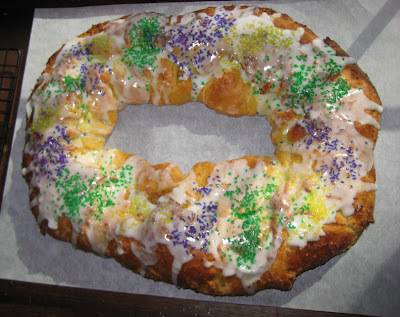 Here in Pennsylvania, the Shrove Tuesday tradition is fastnachts, which are a kind of donut. And at our Presbyterian church back in Maryland, they always had a pancake supper in the British tradition. I'll do either one. This year, hubby will bring donuts home. 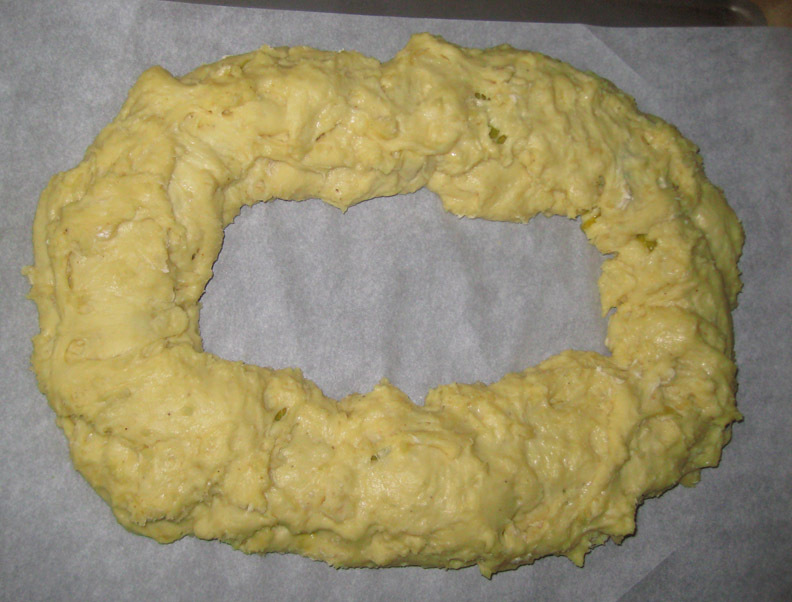 Jan - We never had a Shrove Tuesday tradition in my family, but I could do donuts, no problem!